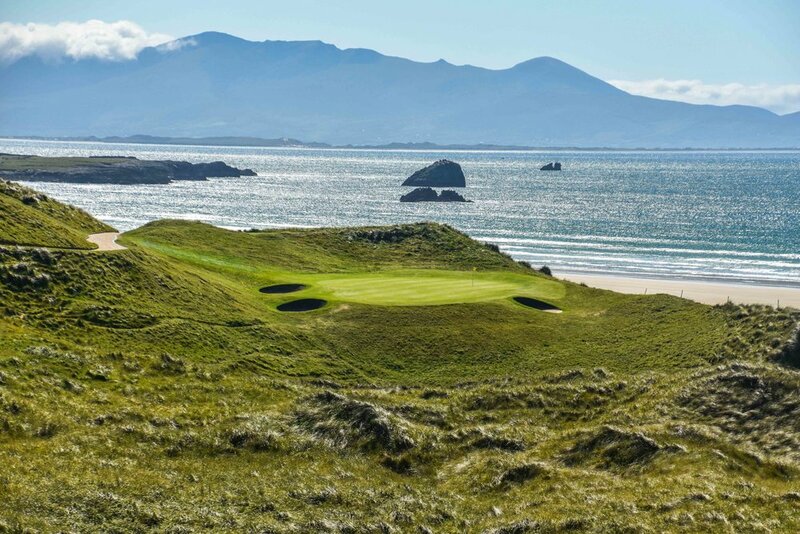 After reading countless books and listening to endless accounts of the golf in Ireland, I finally booked my flight to visit and play. I would play 13 courses in 8 days, and at the end, the only thing I would wonder, is why I had not done this sooner. On the flight over the pond, I decided to take in the book "A Course Called Ireland" by Tom Coyne. The book is a self told tale of a man who decides to walk around the entire country of Ireland playing golf. Although I had time constraints and would need to drive in between courses, the book got me in the mood to golf hard. As the wheels hit the ground and I started driving my rental car on the wrong (left) side of the road, I wasted no time in hitting the links. The journey began with a day of 45 holes between the 27 at Portmarnock and 18 at The Island. Fortunately, the wind would only give me a gentle welcome with 15-20mph breezes nipping at my ball. I would take advantage of the good conditions and card several rounds in the 70's. The golf train was off and rolling hard. It would not slow down for 7 days and I would not touch the brakes. Next up was the world's #1 ranked golf course, Royal County Down. With expectations bordering on ridiculous, the course did manage to meet most of my expectations. Royal County Down is indeed one of the best courses I have seen. The course never really lets up, but highlights include the par 3, 4th hole and the approach on #9. In an unrelated note, Royal County Down set the record for most pictures taken at a course with 295. It is as scenic as it is good. A click on any of the pictures or links throughout the post will take you to a course's full gallery. A look back on the par 3 4th at Royal County Down. Next up was a visit to the world's oldest clubhouse and a round of golf at Ardglass Golf Club. Built in 1405, the pro shop is housed in an old castle. Just take several steps out of the castle and wander past some cannons and you will find the first tee. You won't find anything like this in Florida. It was at this point during my trip that I stopped paying attention to yardages on the scorecards. With consistent 30mph winds, 6,260 yards has little meaning. If you are planning a visit to Royal County Down, I highly suggest staying at the Slieve Donard. For a castle right next door to the world's highest rated golf course, it's not too pricey. What a clubhouse built in 1405 looks like in 2017. The tee shot on the opener at Ardglass. Even though it was a decent drive up to Royal Portrush, I wasn't about to skip the newest edition to The Open rotation. In order to earn their spot in the rota, Royal Portrush scrapped their existing 17th and 18th holes and built 2 new holes on the edge of the property. I was able to see them, but I just missed the official opening by 2 weeks. Although it was one of my favorites, Royal Portrush was probably the toughest test of golf that I faced on my trip. The rough is very penal and if you are hitting it sideways, which is easy to do in 30mph winds, you will lose plenty of golf balls. I am looking forward to watching The Open in 2019. The 5th hole at Royal Portrush gives you a stunning welcome to the water. It does take some time getting used to driving on the left side of the road, but after a 6 hour drive down to the town of Lahinch, I was feeling confident with my motorist abilities. At Lahinch, I would encounter the only sub par weather of the trip. We made the most of it by sliding down the fescue and generally enjoying the misty and rainy conditions. One of my favorite aspects of Irish golf are these grass walking paths. It was a shame not to catch Lahinch in more ideal weather conditions. The course is a real stunner with some good lighting on it. Although, they have a saying in Ireland that goes like this... "If you don't like the weather, just wait a minute." As it turns out, some of my best lighting would come moments later at Doonbeg with an afternoon round. The 6th hole is drive-able from the gold tees. With views like this, I didn't care too much about missing my short eagle putt. Up next, was a visit to Tralee Golf Club. The open nine sweeps out to the ocean's edge quickly and treats the golf to some fine views of 14th century castle remains. However, it is the back nine that receives most of the attention due to it's bold setting and design by architect Ed Seay. Some golfers may argue that the 440 yard par 4 12th hole, that usually plays into a prevailing wind, is a tad excessive. Especially, with an 80 foot chasm before the green. However, given that most golfers in the UK and Ireland prefer match to stroke play, the design becomes far more interesting when considering your opponent's score instead of par. You are far better off keeping this mentality in mind as you play Tralee and the rest of Ireland. Into the wind, the par 3 16th, can sometimes require a driver to reach the surface. Fortunately, the breeze was benign and my 8 iron landed softly. After a fine outing at Tralee, a day of 36 was up next at Dooks and Waterville. With the courses 30 minutes apart, this was an easy one to add to the calendar. Not sure why Dooks is considered off the traditional path, as it has one of the best settings for golf in Ireland. It is also home to breeding grounds for the Natterjack toad. Not only is Natterjack toad fun to say, but it is also the course's logo. On the first tee at Waterville, I noticed that something was missing. Something felt off. Why was it so quiet? Where was the sound of 30 mph wind blasting across my ears!?!? The wind had stopped completely. I didn't question things for too long and starting firing my ball at the limp flags. As predicted, the afternoon breezes would freshen up and golf scores would return to normal. Views on views at Dooks. Waterville from above. Here we see the 4th and 15th greens at the very edge of the golf course. After a drive further south, I would arrive at the much anticipated Ballybunion. In addition to having an interesting name, the course has some golf holes of interest as well. The most anticipated being the 8th hole. My buddy Xan had made an ace some ten years ago and I had vowed to return to the scene and duplicate his feat. In an extremely anticlimactic moment, I would fly the green and make bogey. The hunt for my first ace marches on. 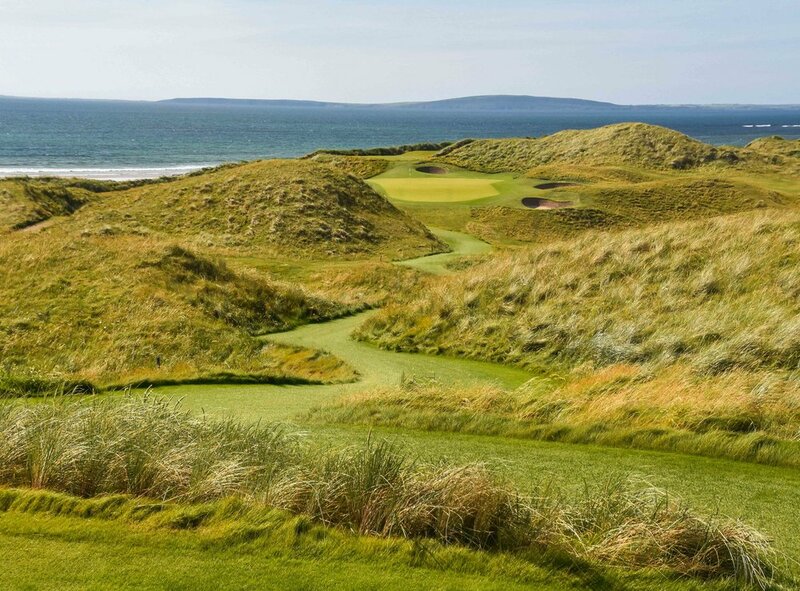 It is easy to see why everyone raves about Ballybunion as it delivers on just about every level and has several holes in contention for the "Golden Shamrock" awards. Just as the name indicates, the forthcoming awards should not be taken too seriously and YouTube style arguments are encouraged in the comments. The Golden Shamrocks: Stupid Name, Serious Awards. The cool factor of the grass path here may take your mind off the fact that you need a punch driver to find the surface. With only one day left in Ireland, I would wrap things up with a day of 36 at Cork Golf Club and Old Head. Cork was the only "non-links" course on the agenda, but with architectural credit to Alister Mackenzie, it was an easy one to add. Cork Golf Club, like every other course on the trip, did not disappoint. The setting for golf at Old Head is unlike any other on this planet. Old Head has been criticized for the disjointed nature of the "inland" holes with those along the coast. After playing, I can certainly see the merits in such claims, but the experience of the round should outweigh most gripes one can find. For a "golfographer" like myself, the stunning views and unique shots kept my attention just fine. The par 3 16th at Old Head with the lighthouse in the distance. Best of trip awards: The "Golden Shamrocks"
Best par 3: I had planned on making at least one ace on the trip and then just giving the shamrock to that hole. However, I did not make an ace and the award goes where it belongs... to No 4 at Royal County Down. Shot of the trip: The 3 iron that came in sideways off the sea and smacked into the flagstick on #2 at Ardglass. I would miss the short birdie putt and slump off to #3. Best roadside snack: Between rounds on an international golf trip it is important to stay properly fueled. Gas stations in Ireland carry these chocolate graham cracker things called Hobnobs. It's basically gasoline for birdies. Winner: Hobnobs. Best par 4: With approximately 130 contenders in this category, the battle was tense. Early on, the 1st hole at Ardglass was in the lead, then Lahinch and Tralee happened. But in the end, the 11th hole at Ballybunion with it's views, it's challenge, and it's playing options, could simply not be beat. Best tweet: If you haven't noticed, the golf tweets have been extra spicy lately. This one was brought to you by the caddies at Ballybunion. Me: Sprays tee ball deep into the dunes. "That's good over there, right?" Best par 5: With contenders from the 1890's doing battle against designs from the 1990's. This one was real hard to judge. Although if you stand on 12 tee box at Old Head long enough, she will convince you. Winner: #12 Old Head Golf Links. Most treacherous green: Inside the Waterville house, there is an absurdly long hallway that leads to the Tillinghast room. Legend has it that Tiger Woods 4 putted this hallway during his visit to Waterville. Best Overall Course: This is by far and away the most frequently asked question I have been asked. It is also a ridiculous question to answer. Each course that I played had tremendous character, outstanding conditions, with fun and unique playing options. The photographs should convince you of each course's unique beauty and setting. The final Shamrock award reminds me of the book that I read on my way over here. Winner: That course called Ireland.